Yucca Telecom is your local Internet service provider. 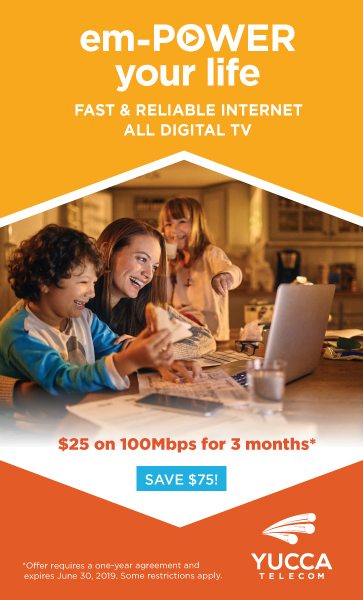 We offer high-speed, reliable Internet service for a price to fit your budget. Fiber fast internet, all digital TV, phone service and computer repair technicians all available at Yucca Telecom. Order services now. Business Solutions: Call Yucca’s Business Office at 575-226-2255. With some of the fastest and most reliable speeds available today, our BUSINESS CLASS Internet packages make sure you have the speed and support you need to get things done quickly and efficiently. We offer the best solutions with the latest technology. When you are ready to save money and experience super fast Internet, give us a call. Switching is simple and easy! *Some restrictions may apply. High speed internet connections vary by location. A Yucca customer service representative will be able to verify the best high speed internet option available for your service location. Not all speeds and services available in all areas to all subscribers. Tax, fees, and restrictions apply. Price does not include applicable taxes and regulatory fees. Phone line required for Internet services in rural exchanges. Unlimited Long Distance Service is restricted to calls terminated to points within the continental United States. Other restrictions may apply.